William Tecumseh Sherman (Lancaster, Ohio, 1820 – New York, 1891) was a Union Civil War general known for his daring and aggressive military tactics. His "scorched earth" policy of total warfare was designed to ensure the economic, strategic, and psychological collapse of the Confederacy by destroying civilian infrastructure and supplies. The son of a prominent lawyer who died when the boy was young, Sherman was raised in an intensely political family. His foster father was Thomas Ewing (1789-1871), Whig Senator and a cabinet member for two presidents. His brother John Sherman (1823-1900) was a powerful Republican Congressman during the Civil War. Sherman himself married Ewing's daughter Ellen. These connections guaranteed that Sherman would be well placed—and well protected if anything went wrong (as they did in Kentucky in 1861). Sherman was a West Point graduate. He was deployed to Florida in the Seminole war, and to California after the Mexican War. He had almost no combat experience. Sherman resigned from the Army in 1853 and without much success became a banker and a lawyer (admitted to the bar in Kansas City without examination "on the ground of general intelligence"). In 1859 he became first superintendent of the Louisiana State Seminary of Learning and Military Academy, the later Louisiana State University. He never bought a slave and when secession loomed, Sherman quit his job and moved North, after warning Southerners that it was folly to war against the much more powerful North. Sherman initially was unenthusiastic for the war, only applying for an officer's commission when three-year volunteers were called for in May 1861. He was appointed Colonel in the US Army (instead of Colonel of volunteers) and quickly rose to the command of a brigade, participating in the first battle of Bull Run. Sherman's performance in that battle was judged above-average (although his brigade joined the general Union rout), and he was sent as second-in command to the Department of the Cumberland, focusing on Kentucky. Upon the resignation of his commander on medical grounds, Sherman became commander of the Department. He may have suffered a mental breakdown; newspapers rumored he was "crazy" for vastly overstating the enemy strength and the amount of Union troops required to successfully campaign in his Department. Sherman was relieved of independent command by Don Carlos Buell, was granted a leave of absence, and returned to St. Louis as a subordinate of Henry Wager Halleck. During Ulysses S. Grant's campaign against Forts Henry and Donelson, the Confederate strong-points defending the Tennessee and Cumberland rivers, Sherman was appointed commander of Paducah, Kentucky, and was responsible for sending supplies and reinforcements to Grant. There he built himself a division, which he took to the field in time to participate in the battle of Shiloh. As that battle began on the early morning of April 6, 1862, Sherman was the ranking officer on the field; his immediate superior Grant was at Savannah. The Confederates surprised the Union forces, and Sherman and Grant were blamed for that debacle. Sherman rallied his troops, stabilizing his part of the Union line and slowly retreating in the face of the fierce Confederate attack. He was praised for his performance by Grant and theater commander Halleck, and was promoted to major general of volunteers on May 1, 1862. After Shiloh, Sherman's division participated in the Union march on Corinth. Afterwards, Sherman became military governor of Memphis, Tennessee. When Grant assumed command of the Army of the Tennessee, he set out to conquer Vicksburg, Mississippi, one of the last few Confederate positions on the Mississippi River. Grant decided to attack Vicksburg over land from the northeast, and Sherman was sent on a diversionary attack down the Mississippi. When Grant's part of the operation failed, Sherman faced the Confederate defenders alone and suffered a bloody repulse at the battle of Chickasaw Bayou on December 29, 1862 when he launched a frontal attack against Confederates in heavily entrenched positions. Sherman then came under the command of political general John A. McClernand, whom he persuaded to launch an attack on Arkansas Post, a Confederate stronghold on the lower Arkansas River which had been used to harass Union shipping on the Mississippi. The attack, carried out with overwhelming force and in conjunction with Union gunboats, was a complete success, with 5,000 confederates taken prisoner. When Grand reasserted his command, operations against Vicksburg continued. During the first months of 1863, Grant tried several schemes to put steamboats below Vicksburg while avoiding its powerful batteries commanding the Mississippi. Sherman's troops were sent on expeditions to find and secure a navigable waterway through the maze of tributaries and bayous north of Vicksburg. The Confederates stymied these efforts by obstructing the narrow rivers. When Grant finally decided to send his transports south of Vicksburg by running the batteries, he sent Sherman off on a diversionary attack. Sherman returned to Chickasaw Bayou, but did not engage the Confederates in a major engagement. When Sherman's troops returned and joined the rest of Grant's command in the southwest of Vicksburg, they became a rearguard. Grant outmaneuvered the defenders of Vicksburg by moving north instead of directly towards Vicksburg; in this way he not only defeated several Confederate detachments piecemeal, but also interposed his army between Vicksburg and Mississippi's state capitol of Jackson. When Grant turned west to deal with Vicksburg's defenders, Sherman was sent east to conquer Jackson and disperse the Confederate reinforcements gathering there under the command of general Joseph E. Johnston. Johnston's vastly outnumbered forces retreated; a junction between Johnston and the defenders of Vicksburg had been prevented. Sherman joined Grant's main army after Vicksburg had been invested. His troops participated in the assaults on Vicksburg on May 19 and May 22, but without success. Siege operations were begun. When Johnston returned to the Union rear, Sherman's forces were detached to check this threat. Both Sherman and Johnston avoided a major engagement until after the fall of Vicksburg on July 4. Then Grant heavily reinforced Sherman, who was able to drive Johnston away, recapturing Jackson in the process. Sherman destroyed Jackson's military infrastructure and public buildings, but did not pursue Johnston's army any further. Meanwhile, the Union Army of the Cumberland had been defeated by Confederate general Braxton Bragg at the battle of Chickamauga and had been invested in Chattanooga. When the Army of the Cumberland's commander showed a lack of aggressiveness and self-confidence, Grant was appointed commander of all Union armies in the western theater, and he set out to relieve the siege of Chattanooga and deal with Bragg. Sherman succeeded Grant in command of the Army of the Tennessee, and his troops were sent to Chattanooga; in the battle of Chattanooga on November 25, they were supposed to crush the Confederate left flank, but failed to make much progress until the Confederate center crumbled to a determined assault by the Army of the Cumberland. In the aftermath, Sherman was dispatched to Knoxville to relieve yet another besieged Union army. By early 1864, Sherman was back in his assigned theater on the Mississippi. In order to stop Confederate attacks on Union shipping and to deny the Confederates the use of central Mississippi's resources, he set out on an army-sized raid to Meridian, capturing the town on February 14. Sherman proceeded to destroy railways and military infrastructure in the vicinity, a small-scale test of the methods he would later employ on his March to the Sea. When Grant was promoted to general in chief, Sherman succeeded him to command of the western theater. Under Grant's plans for 1864, Sherman was to defeat the remnants of Bragg's army, by now commanded by Joseph E. Johnston, reinforced and reorganized. Johnston hat taken a powerful defensive position at Dalton in north Georgia, defending the railway from Chattanooga to Atlanta. In a campaign of maneuver, Sherman repeatedly outflanked Johnston and forced him to retreat from several entrenched positions, driving him out of the mountains of northern Georgia and back towards Atlanta. While skirmishing was heavy throughout the campaign, Sherman mostly avoided all-out assaults, with the exception of the battle of Kennesaw Mountain on June 27, 1864, where Sherman believed Johnston had overextended his forces. The Union attack was repulsed with heavy losses, though. Thus, Sherman returned to outflanking Johnston. By July 17, Confederate President Jefferson Davis had lost patience with Johnston: Davis believed Johnston would not stop retreating and give up Atlanta without a determined effort to hold the valuable railroad junction. He relieved Johnston and transferred Confederate command to the more aggressive John Bell Hood. When Sherman, who respected Johnston and his style of warfare, learned of the change, he was elated: A battle in the open (or even with the Confederates attacking Union entrenchments) would suit his army, which outnumbered the Confederates about 1.5:1, well. Indeed, Hood launched several attacks on Sherman, but he was repulsed at the battle of Peachtree Creek on July 20, the battle of Atlanta on July 22 and the battle of Ezra Church on July 28 with heavy losses. Sherman failed to completely invest Atlanta and cut the railroad lines supplying Hood's forces, though. During August, Sherman besieged Atlanta, trying to extend his lines to a point which would allow him to cut the railroads. He finally succeeded on August 31 when his forces defeated a detachment of two corps under Confederate general Hardee at the battle of Jones borough; Hood evacuated Atlanta, which was occupied by Union troops on September 2. Sherman evicted the inhabitants of Atlanta and turned the city into a supply depot. While Union and Confederate losses during the campaign were roughly equal, Sherman had started with a larger army, had received reinforcements and by now outnumbered Hood more than two to one. Grant wanted Sherman to finish off Hood, but Sherman preferred to strike at the heart of the Confederacy. Sherman managed to convince both Grant and President Lincoln. Thus, when Hood marched north on his ill-fated Tennessee campaign, Sherman sent his most trusted subordinate, general George H. Thomas, and large reinforcements to Nashville to deal with Hood while he took about 60,000 Union veterans on his March to the Sea from Atlanta to Savannah, living off the land, destroying Confederate infrastructure and generally demonstrating that the Confederate forces were unable to protect their citizens from the ravages of war. Some Confederate cavalry was the only force to oppose him until he reached the coast, and it proved barely a hindrance to Sherman's columns. Savannah was captured on December 21, just in time for Sherman to present it to Lincoln as a "Christmas present". When Grant wanted Sherman to reinforce him at the siege of Richmond, Sherman convinced Grant to let him march there through the Carolinas instead of transporting his forces by ship. South Carolina was considered a hotbed of secession by the Union troops, and the devastation wrought there was especially heavy. Confederate resistance remained negligible for most of the campaign. Joseph E. Johnston had been reinstalled as Confederate commander, but he lacked the forces to pose a serious threat to Sherman. When the remnants of Hood's army, which had suffered a devastating defeat at Nashville, arrived in the theater, Johnston commanded about 20,000 soldiers against Sherman's 60,000 troops. Johnston still managed to blunt the Union advance when he confronted one of Sherman's columns at the battle of Bentonville on March 19–21, 1865, but Union reinforcements forced Johnston to retreat. When Robert E. Lee surrendered his Army of Northern Virginia to U. S. Grant on April 9, Johnston deemed the Confederate cause lost. He agreed to an armistice with Sherman on April 18, and Sherman and Johnston engaged in negotiations for Johnston's surrender. Sherman proposed lenient terms, touching not only on military matters but also on political reconstruction of the South. When Sherman submitted these terms to Washington, he was strongly rebuffed for overstepping his authority, and Grant was sent to make sure Sherman only secured the surrender of Johnston's forces. Johnston formally surrendered the confederate forces in his department, encompassing the Carolinas, Georgia and Florida, to Sherman on April 29. Sherman was promoted to Lieutenant General and served in the western United States, supervising Army operations against the Plains Indians. 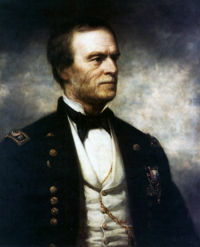 When Grant became President, Sherman succeeded him as Commanding General of the United States Army. He held that post until November 1, 1883, and retired from the army on February 8, 1884. He was proposed as Republican candidate for the 1884 presidential elections, but he declined emphatically, saying "If nominated I will not run; if elected I will not serve." This "Sherman Statement" has become the formula to use if one really does not want to run for office. He moved to New York City and died there on February 14, 1891. Joseph E. Johnston served as pallbearer for the funeral procession. Despite the cold weather Johnston refused to wear a hat out of respect for his former adversary. Johnston contracted pneumonia and died one month later. Bailey, Anne J. War and Ruin: William T. Sherman and the Savannah Campaign (2003). 152 pp. Campbell, Jacqueline Glass. When Sherman Marched North from the Sea: Resistance on the Confederate Home Front (2003). 177 pp.